Hello folks, how are we all doing this fine Winter’s day? Thank you for taking the time to visit my little Hobbies and Leisure blog, I really appreciate every page view at the moment. Today I wanted to share with you a little bit more about one of my favourite hobbies, hiking, and more specifically hiking in the Irish countryside. I’d call myself a wee bit of a country boy. I grew up working on a farm in County Galway and have moved barely 10 kms from where I grew up. Going on long walks with my parents and our two dogs, Sheppy and Pogo, was a Sunday evening pastime. We’d walk the dogs through the hills for about 45 before heading back home, where Mum would make dinner. I’ve kept up this tradition with my family, although me and the wife take it in turns to cook, and now our Sunday walks have become slowly more adventurous, and instead of walking for 1 hour, we’ve taken to walking for up to 5-6 hours a day even. One of my favourite walks to do is the Lough Coolin Loop, which is just under 16 km, and takes around 3-4 hours depending on how fast you walk. It’s a moderate walk on country roads, and old bog roads, and goes through parts of the woods. 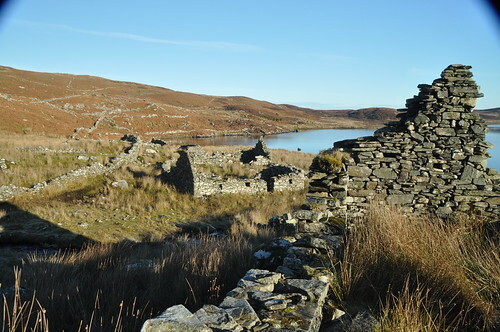 It loops around Lough Coolin, which is a beautiful little Corrie lake, and you can see remains from an old famine village along the shore. It’s a great walk, with some beautiful and interesting views and the village is great to explore with younger children, me and the wife used to take ours a couple of times a year and they would discover something new each time. Are there any walks across Ireland you’d recommend for a hiking lover like me? Let me know. Thanks for reading, Toodles.